Entry to Singapore's Parliament House in the Civic District of Downtown Singapore. 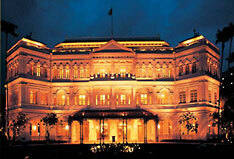 A virtual travel guide to Singapura; the Malay name for "Lion City". 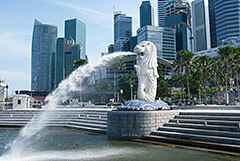 The city-state in Southeast Asia consists of the island of Singapore and about 54 smaller islands. 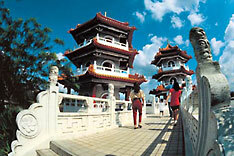 The main island is linked by a causeway to Johor Baru on the southern tip of the Malay Peninsula. The former British colonial trading post is since its independency in 1965, officially the Republic of Singapore, the city state is situated 137 km (85 mi) north of the equator, and just south of Peninsular Malaysia. 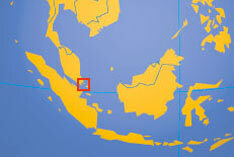 In south the Strait of Singapore separates the island from the Riau Archipelago of Indonesia. Singapore occupies an area of 718 km², compared, it is the smallest state in Southeast Asia, slightly larger then one fourth of Luxembourg or also slightly larger than 3.5 times the size of the District of Columbia, Washington, DC. The city state has a population of 5.6 million people, and a resident population of 3.9 million (in 2016). Official languages are English (language of administration), Malay, Mandarin, and Tamil. Singapore is famous for being a global financial center, a shopping paradise, and as a spot for a variety of activities, dining and entertainment. Location: Southeast Asia, islands between Malaysia and Indonesia. Terrain: Lowland; gently undulating central plateau contains water catchment area and nature preserve. Climate: equatorial, a tropical rainforest climate; hot and humid. Religions: Buddhist (Chinese), Muslim (Malays), Christian, Hindu, Sikh, Taoist, Confucianist. Natural resources: Fish, deepwater ports. Agriculture - products: Rubber, copra, fruit, orchids, vegetables, poultry, eggs, fish, ornamental fish. Industries: Electronics, chemicals, financial services, oil drilling equipment, petroleum refining, rubber processing and rubber products, processed food and beverages, ship repair, offshore platform construction, life sciences, entrepot trade. The island city-state on the southern tip of Malay Peninsula has seen many rulers in its history. It has been an outpost of the ancient Sumatran Srivijaya empire; it was part of the Sultanate of Johore in the 15th and 16th century, and it was burned down by Portugese forces in 1617. In the beginning of the 19th century Singapore became a trade post and settlement of the British East India Company and some years later a British crown colony. Singapore is today (beside Monaco) the most densely populated independent country in the world. Its strategic location combined with a largely corruption-free government, a skilled work force, pro-foreign investment and export-oriented, led to a successful free-market economy which attracts international investment funds on a large scale despite its relatively high-cost operating environment. 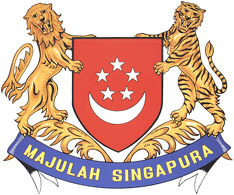 Singapore is a parliamentary representative democratic republic with a (in theory) multi-party system. Since 1965, Singapore's policy has been dominated by the People's Action Party (PAP). Therefore, Singapore is classified as a one-party state by critics. Head of state is the President, head of government is the Prime Minister. Voting at Singapore's presidential elections or parliamentary elections is compulsory for all eligible citizens. On the other hand, Singapore has been consistently rated in the Top10 of the least corrupt countries in the world by Transparency International. Office of the President of the Republic. Official site of the Cabinet. Official web site of the Parliament. The government directory lists Ministries, Organs of State, ond other institutions. Official site of the Ministry of Foreign Affairs. Embassy of Singapore to the U.S. Address list of Singapore Embassies Abroad. Addresses of Foreign High Commissions, Embassies, Consulates and International Organizations. Statistical figures, census and more. Searchable map and satellite view of Singapore. News portal with various newspapers. Where Asian Cultures Come Alive - the first museum in the region to present a broad perspective of pan-Asian cultures and civilizations. 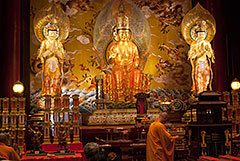 The famous Buddhist temple in Chinatown is worth a visit. Theaters on the Bay, is Singapore's a performing arts center. Singapore's oldest museum hosts Singapore Living Galleries: Fashion, Film & Wayang (shadow puppet theater), Photography and Food. Local and Southeast Asian modern and contemporary art. Celebrations of cultural diversity and artistic innovation: dance, music, theater. Singapore celebrates fashion on a grand scale. Feast Your Senses - Singapore's Food Festival brings together Asian and international cuisine. One of Asia's foremost gastronomic event, the annual epicurean festival that showcases the intricate craftsmanship of prestigious chefs. insurance, securities and the financial sector in general. Official site of Singapore Stock Exchange. Official site of the Chamber. 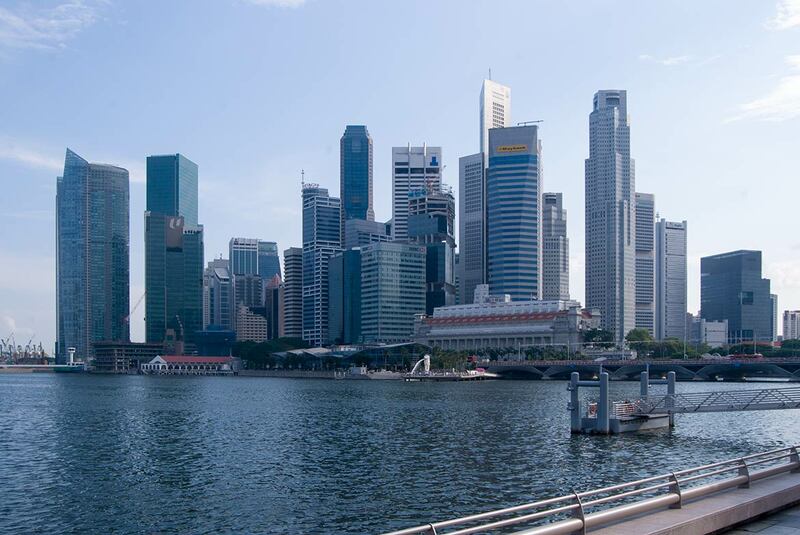 spearheading Singapore's efforts to develop its external economic wing. DBS is a Singaporean multinational banking and financial services corporation headquartered in Marina Bay, Singapore. Oversea-Chinese Banking Corporation, a publicly listed financial services organization, headquartered in Singapore. United Overseas Bank is a multinational banking organization headquartered in Singapore, UOB has branches in most Southeast Asian countries. M1 Limited is one of the three major telcos operating in Singapore. Singapore Telecommunications Limited, a major telecommunications company with operations in 20 countries. Subsidiary internet service provider of SingTel. 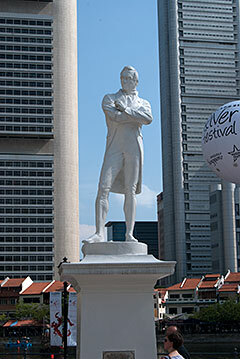 Great Eastern Life is the oldest insurance company in Asia, it is largest life insurer in Singapore and Malaysia. The group’s subsidiaries and associated companies include Frasers Centrepoint, Asia Pacific Breweries and Times Publishing. Fraser and Neave is since 2013 a subsidiary of ThaiBev (Chang Beer, Thailand). Company focused on marine, property and infrastructure businesses. Sembcorp Marine provides engineering solutions, the company is headquartered in Singapore. Asia’s leading agribusiness group, founded in 1991 and headquartered in Singapore. Singapore positions itself as a leading aviation hub, strategically located at the heart of the Asia-Pacific region, and well-placed to benefit from the growth potential of aviation-related activities such as air cargo handling, maintenance, repair and overhaul (MRO) services and aircraft manufacturing. Official site of the national carrier, based at Changi Airport. The regional wing of Singapore Airlines, connects 25 destinations in Asia. Low-cost long-haul airline owned by Singapore Airlines with destinations in Asia and Australia. Singapore based budget airline with flights to regional destinations in Southeast Asia, Australia, Japan, China and India. Official site of Changi Airport. The state's mass rapid transit passenger service. Public Transport information with interactive maps to get around Singapore. Discover the Lion City: Central Business District, Orchard Road, Chinatown, Little India, Boat Quay, Night Safari, Bugis and Kampong Glam, Jurong Bird Park, Sentosa, Jurong Island, Pulau Tekong, Pulau Ubin. Hotel, accommodation, attractions, festivals, events, tourist boards, recreation, dining, shopping, tours and much more. The official destination website with comprehensive travel and tourism information. 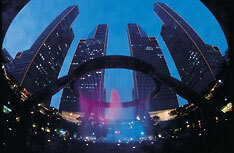 Informs you about the attractions and events of the Lion City. Another official city guide to Lion City. Travel and tourism information plus event calendar. Another information portal, a gateway to culture, events, recreation & sports. Local shopping, dining and entertainment. A tour guide to Sentosa, the premier island resort. 5 star hotel in the Civic District. Homepage of the grand old dame of the city. Sale event in Asia's shopper's paradise. The University was founded in 1905. The University's Libraries are a group of six multi-disciplinary libraries. Official site with comprehensive information on a very wide range of programmes and courses offered by the Polytechnic. Bird park in Jurong Town. To ensure a quality environment for Singaporeans, for now and for generations to come. Extensive tour guide to Parks and Gardens. Regional park, botanical institution, and tourist destination. All about nature in the Lion City. History outline of the city state of Singapore.